Have you ever worked at a fast food restaurant? Do have any idea what that job looks like? Most of the population might have been involved in this industry at one point in their lives, if not, let us tell you from experience, it’s simply exhausting; both physically and mentally. You stand there doing repetitive, boring tasks during the whole shift with little to no rest. If you don’t believe us, try it yourselves or ask a friend and you’ll understand why that is a job that a robot could, and should do instead of humans. And that just might happen in the near future, since there are now multiple companies developing robots to work as cooking assistants. 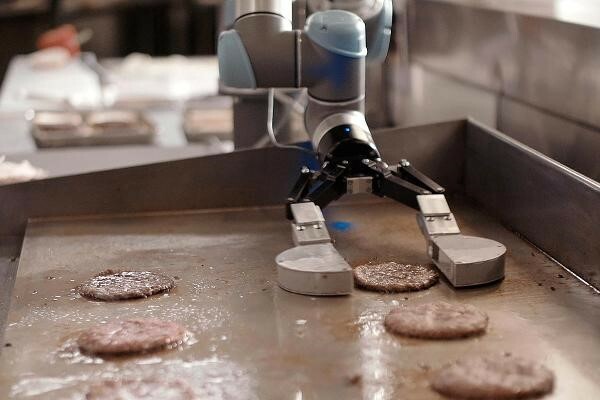 One of them is Miso Robotics and they recently developed Flippy, the burger flipping robot. Many companies are developing similar robots, but what makes Flippy different is the way it works. Flippy uses an AI system, machine learning and computer vision to grab unwrapped burger patties, move them into position on a hot grill, keep track of each burger’s cook-time and temperature, then alert human cooks when it’s time to apply cheese or other toppings. Flippy plates burgers but doesn’t wrap them or add finishing touches like lettuce, tomatoes, avocado or a restaurant’s signature sauce. One of the biggest problems in the restaurant and accommodation industry is the employee turnover rate, which was 73 percent in 2016. People who flip burgers or work on the fryer move on from a job faster than any other worker. The main goal of these cooking assistant robots is making their job easier and keeping them at the same job for a longer period of time. They will most certainly replace some of the working staff, but they work primarily as cooking assistants, so humans will still have something to do. We think that advancements in tech like this opens up many possibilities. For example, our engineer at CroatiaTech could develop your own AI software and design a kitchen assistant robot similar to Miso Robotics’ Flippy. All in all, you can see robots are gradually entering our daily lives and making it easier. Of course, there are some people who are against this, but there is a growing majority that is ready to accept robots who can do all the boring work. After all, not every major breakthrough in history was met with acceptance at first, but people slowly started to realize the benefits and time savings offered by using it. We’d argue that this convenience is also what will lead us to eventually accept robot co-workers.